At Karam Immigration Law, our team provides personalized service to victims of crime, trafficking and domestic violence or abuse. We handle complex cases and challenging immigration matters. We strive to find creative solutions to help people to get legal status. In 1993, Congress passed the Violence Against Women Act (VAWA) for victims of domestic violence or abuse. VAWA allows victims of domestic violence or emotional, psychological or financial abuse in family relationships to apply for legal status in the U.S. These options are available to victims regardless of their immigration status. In some cases, even a person who has been ordered deported from the United States may apply. 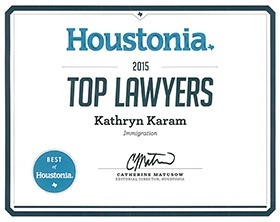 Call Karam Immigration Law today at (832) 582-0620 to set up a consultation. Karam Immigration Law assists people seeking assistance as victims of crime, trafficking or domestic violence or abuse in the Houston area, including Sugar Land, Alief, Sharpstown, Bellaire, Spring Branch, The Woodlands, Clear Lake, League City, Kingwood, Cypress or Tomball. If you have been a victim of a crime or trafficking we urge you to learn about your immigration options for victims of crimes and seriously consider them. The U.S. immigration system has several options for victims of crime, victims of trafficking, and victims of domestic violence or emotional, psychological, or financial abuse. It’s surprising how many people qualify to file for a T visa as a victim of trafficking, and many simply do not know that what’s happened to them can be considered “trafficking” or they are resigned to the idea that this type of thing happens to undocumented people and there’s nothing they can do about it. But there is. We assist victims of trafficking with applications for T visas and other services. If you think you may be a victim of trafficking right now or in the past, consult with an experienced immigration lawyer so you know your immigration options. The TVPRA also created the U visa for victims of certain crimes who have been helpful, are helping, or will be helpful to law enforcement during an investigation of the crime. The U visa requires that a crime victim report the criminal activity and obtain a certification from a law enforcement agency that the person is a victim and has been, is, or will be helpful in an investigation. If you have been a victim of a crime and you spoke to the police or other law enforcement officers or a district attorney or prosecutor about the crime, or your minor child has been a victim of a crime, you may qualify to apply for a U visa. If you are in the United States without legal status (or temporary status), or you are applying for immigration based on a family relationship and feel trapped in an abusive or violent relationship, it is important for you to understand all of your legal options. In addition to the options above, you may qualify to apply for a green card based on the Violence Against Women Act (VAWA). Parent of a U.S. citizen child age 21 or older. “Abuse” includes both battery (physical abuse) or extreme cruelty (severe emotional or non-physical abuse) by the U.S. citizen or lawful permanent resident family member. If you are experiencing abuse in one of the family relationships listed above, consider the Violence Against Women Act. If you are applying for a green card based on marriage and you are experiencing abuse, know that you do not have to feel trapped – VAWA offers a way out of an abusive marriage. “I don’t want to affect my immigration case” –People who have an immigration petition or application that has already been filed for them often worry that reporting a crime or filing an application for a T visa, U visa, or VAWA will affect their pending immigration case. Depending on the situation, these other options may have no effect on the pending case, or it may be a better option than the application they currently have pending. “I don’t want to look like I’m complaining/a troublemaker” – People who qualify to apply for T visas, particularly those who are victims of labor trafficking, are often concerned that reporting issues with their working conditions, work hours or pay deductions will cause the U. S. government to view them as a “troublemaker”, and this might hurt their future immigration applications. What some people do not know is that a T visa case might be their best option, and for others, it may be their only viable option. Crime victims and victims of domestic violence may be concerned that they should not bring their concerns forward because they are undocumented, so they may feel guilt that they have also “done wrong” or that they “deserve” what they got. No one deserves to be a victim, and the TVPA and VAWA are part of U.S. law to protect victims, including undocumented victims. “I don’t have proof of what happened”- Victims of trafficking, crime or domestic violence sometimes don’t talk about what has happened to them. When they finally do disclose what has happened, I ask why they didn’t mention this before. They often respond that they didn’t say anything because “I don’t have any way to prove what happened.” It’s important for victims to understand that in some cases, it doesn’t matter if you have documentation of the events that took place, so it’s important to tell your attorney everything that has happened. I'm a Victim What are my Immigration Options? If you believe you are a victim of trafficking, crime, or domestic abuse, know your options. Talk to a specialized attorney about your situation so you can find out if you qualify to apply for immigration status based on one of the options above.